I think that at some point in our lives all of us will have heard about the ‘Turkish sauna’, but the Turkish hammam is really no ordinary sauna. Its renowned healing powers through steam mean you can relax after a tough congress day and finish off your event in the very best sauna that the Turkish capital can offer. The Ayasofya Hurrem Sultan Hammam (Hürrem Sultan Hamamı) was built in 1556 for Süleyman the Magnificent and thoroughly renovated in 2012. Today it is known as one of the most authentic and unchanged hammams, one where men and women enter separately. Its symmetrical shape and perfect lines make it an architectural gem. The Hammam was open to the public for 350 years until 1910, when the space lost its glory and was used as a storage room for coal and later as a local rug market. 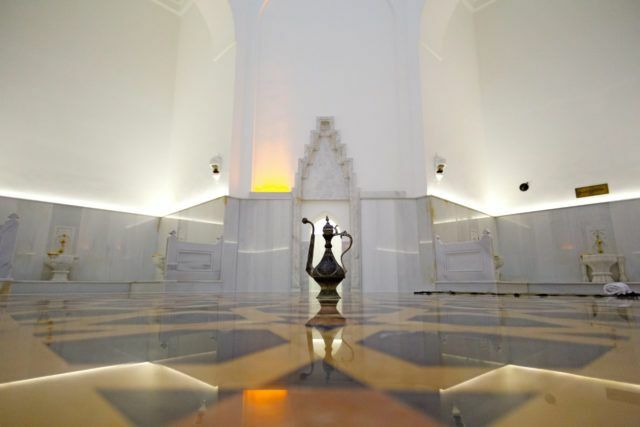 In line with original plans, the Hammam was renovated in 2012 and the end result is a breathtaking space that captivates people with its atmosphere and mood. The sauna can be privatized for groups of up to 40 guests. This tidy part of the city centre has experienced no major construction intrusions and amazing boutique hotels are one thing that Istanbul can truly be proud of. The city has never really changed and it’s still possible to see reminders of the Hippodrome right next to Hotel Eresin. This hotel has two aces up its sleeve – a hotel terrace with views of the Sea of Marmara and the Mosaic Terrace Restaurant. Another jewel hides behind the facade of Hotel Levni, a luxury city hotel in the very centre of the Sultanahmet district, boasting elegance, an excellent location and a great overall offer. Guest comfort is well taken care of, as they offer an ostentatious wellness centre with a hammam and a series of different massages. Its location is a perfect starting point for every city exploration. Levni is suitable for smaller congress and incentive groups that are seeking direct contact with Istanbul’s historical heritage. TIP: When choosing your accommodation in the Turkish capital, go for hotels that are partners of the Istanbul Convention Bureau, as they are usually your best bet. You can check out their members on the following link. Unlike the Finnish sauna, where you can immediately feel the dry heat of the burning stove, Turkish saunas are milder and reach a maximum temperature of 50 degrees Celsius. What’s special about the oriental variant of the sauna is the 90-100 percent humidity, which can supposedly help with rheumatic diseases and even arthritis. Regular visits to the sauna have numerous beneficial effects on the body, from raising your energy levels, reducing stress, ridding your body of toxins, cleansing your skin and keeping your immune system strong and ready to fight colds, asthma or bronchitis. One of the side effects can also be losing a kilo of body fat here and there. A visit to the sauna is a unique and memorable experience for your congress guests, who will feel reborn after walking through the door. We believe it can be a great intensifier of bonds between members of the group. In addition to the staggering mosques and colourful bazaars, one of Istanbul’s biggest hallmarks is its cuisine. I know quite a few people (including myself) that keep returning to Istanbul because of its wide array of different flavours lurking at every corner of the city. The selection of restaurants in Istanbul is truly endless, but if you are roaming around the Hagia Sofia area we suggest trying one of the “eat like a sultan” experiences. Restaurant Mihri operates within the hammam, a coffee shop and restaurant offering good food and even better tea and coffee. Despite the fact that typical “Turkish coffee” comes from Turkey, the locals tend to drink tea served in traditional thin-waist tea glasses all over the city. Drinking tea is more of a social event than anything else, so when invited to a glass of tea, definitely don’t turn down the offer. In existence for more than 500 years makes the Grand Bazaar one of the oldest covered bazaars in the world. It is also one of the biggest, spread across 60 streets with more than 5,000 shops, 60 restaurants, 18 water fountains, 12 mosques and even a school. Finding the treasure in the labyrinth like streets of the bazaar is a unique experience that can be organised in groups of up to 10 participants. First team to find its way to the treasure wins! Instructions and recipes from local masters will get you closer to Ottoman culinary heritage and at the end of the day your team will serve a 4-course meal worthy of a sultan’s approval. 1956 Chevrolet cars, known as ‘Dolmush’ in Turkey, provide a fantastic, unusual experience for airport or restaurant transfers, with drivers dressed in authentic costumes. No matter how many times you visit Istanbul, there will still be places you haven’t seen and things you haven’t tried. The location of the hammam is the epicentre of all the major attractions and we suggest finishing off the hammam experience with a visit to the Basilica Cistern, located near the Blue Mosque. It is one of the most peculiar attractions in Istanbul, the biggest water cistern in former Constantinople and still an impressive sight today. Adding to the mightiness of the 336 marble pillars is a cinematic mellow light illuminating the 9-metre tall Ionic and Corinthian pillars with installations of the mythical creature Medusa on two of them. No wonder Ron Howard chose the cistern as the backdrop of his mystery thriller Inferno. The navel stone temperature reaches 42 degrees and the temperature in the private rooms is 48 degrees. The humidity of the private rooms is 100%. 160 pieces of gold coated bath bowls were made for use of guests. The hammam’s location in the Sultanahmet district is easily accessible, but traffic is likely to clog up during rush hour. Luckily Istanbul can also be explored by either metro or tram.